History: 15 year old boy with hand pain. Short 4th and 5th metacarpals: Radiograph of the left hand shows the 4th and 5th metacarpals are abnormally shorter than the other metacarpals. Additionally, the third metacarpal is abnormally bowed. This is a case of short 4th and 5th metacarpals. Shortened 4th and 5th metacarpals is diagnosed by the metacarpal sign, which involves drawing a line through the heads of the 4th and 5th metacarpals. If the line intersects the head of the third metacarpal, then it is a positive metacarpal sign and diagnostic of a shortened 4th and 5th metacarpals. 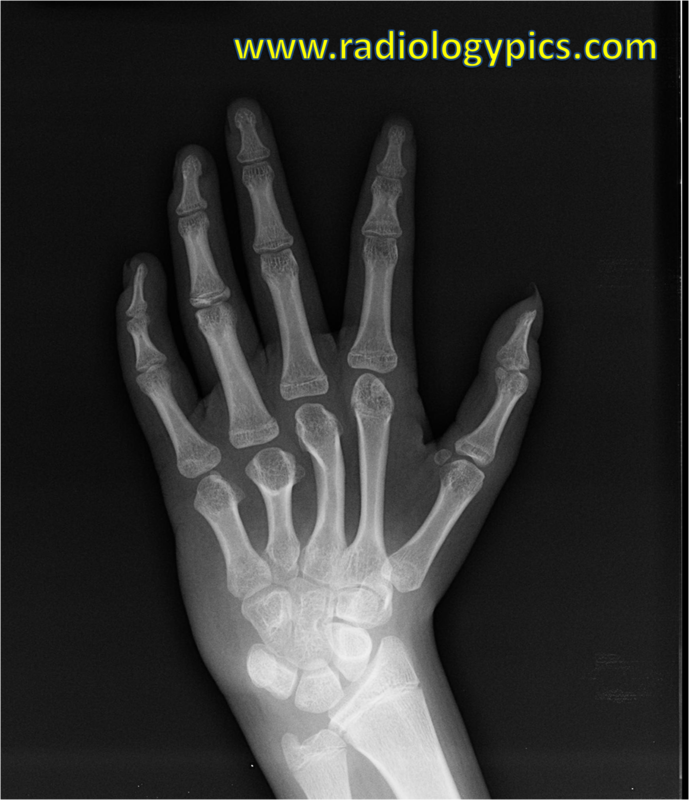 The metacarpal sign unfortunately can be positive in normal individuals about 10% of the time. The cause in this case was idiopathic, which is the most common.